ARTSLAM!’s 6 year anniversary and we are ready to melt some faces right the F**k off! It was so tough trying to top last year’s crazy 5 year anniversary show with Jim Mahfood and Dave Crosland, but we think we got it! This year we are bringing in, not one, not two but THREE amazing artists to paint live with us!! Who? 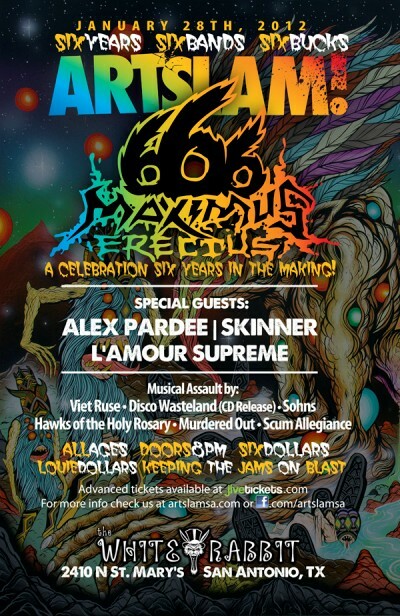 How about, ALEX PARDEE, SKINNER, & L’AMOUR SUPREME! That’s right, The Butcher Kings themselves and one of Mishka’s top artists will be here in SA to paint the night away with 30 local artists! We are calling this show the 666 Maximus Erectus for obvious reasons. It is our 6th year bringing live art to the masses, we have 6 awesome local face melting bands, and it is only 6 bucks for all ages! If you buy tickets in advance you get early admission into the show! A whole unholy hour earlier! We will also have other kinds of freebies to give out throughout the night! ARTSLAM 6 Years in the Making from Adolph Lopez on Vimeo.